Why I didn’t want to teach high school. I started my undergraduate career in the fall of 1999 as an art education major at Western Kentucky University in Bowling Green, Kentucky. My decision to pursue art education stemmed from my experiences in high school and from the close relationship I had with my high school art teacher, Sharon Brown. She was nearing retirement and told me that I would be a wonderful K-12 teacher—and possibly her replacement. When the art program expanded during my senior year and a second art teacher joined the faculty, I got the opportunity to assist with the introductory art class and to earn an independent study credit. Armed with this budding teaching experience and Mrs. Brown’s blessing, I entered the art education program at WKU. After two years of coursework, I returned to my high school to complete my practicum hours. Something had changed. The students, no longer my peers, were frustrating to work with—they seemed lazy and apathetic. I couldn’t relate to them, to their behavior. I was extremely discouraged. By contrast, my studio art classes in college were exciting and a respite from my practicum. After spring break, I changed my major to studio arts and entered the BFA program. I knew I did not want to spend my days educating teenagers. Where my adventures in education took me. I took the scenic route through undergrad, ultimately finishing in the spring of 2007 with a double BFA in painting and ceramics. Then I set up a studio in an old building in downtown Bowling Green with some fellow graduates, and we spent a year making art. At the end of that year, I didn’t know enough about making pots or making a living as a studio potter to rely on it as my sole income source. Being able to quit my restaurant job seemed impossible. In 2008, I moved to Gainesville, Florida, to attend the University of Florida’s post-baccalaureate program. Things fell into place for me at UF. Every week, Linda Arbuckle, my professor (and clay hero), and I talked about pots, form, and surface, and it was thrilling. During that one year, I was accepted into graduate school, made several lifelong friendships, and most importantly met my wife, Naomi, a ceramic certificate student. In my first year of graduate study at the University of Mississippi, I was the teaching assistant for Associate Professor Matt Long, then taught an introductory ceramics class on my own for two semesters. I was surprised by how much I enjoyed teaching and the way in which it energized my making in the studio. After graduating in 2012, I joined the LUX Center for the Arts in Lincoln, Nebraska, as a resident artist. At the center, I developed my work and managed the studio, but it was my teaching experiences in the Lincoln community that defined that year for me. I taught ceramics at homes for the elderly, in elementary after-school programs, in community-center adult education programs, and in community colleges as an adjunct. The education director of the LUX Center of Arts and I worked together to update its curriculum. We adapted some of the strategies that I had learned through teaching courses in graduate school to fit what we could do in an hour-long community class. The experience helped me to think about the unique ways in which each classroom flows and what each class needs in an educator. How I started teaching high school. Naomi and I moved back to Gainesville in 2013 so that she could begin the accelerated nursing program at the University of Florida. Florida Gulf Coast University (FGCU) in Fort Myers hired me as a one-year sabbatical replacement in ceramics. I stayed with my parents in Fort Myers during the week and made the four-hour trek up I-75 every other weekend to be with Naomi. When the year was over, Naomi and I were no longer willing to live apart. She had finished her nursing program, been hired as a nurse at a local hospital, and accepted into the doctorate of nursing program. This meant we would be staying in Gainesville. I had no idea what I was going to do for work. I applied for all kinds of jobs, from waiting tables (which I had done all through undergrad and after) to bagging groceries at Trader Joe’s. Every employer told me I was overqualified because I had a graduate degree. It seemed insane. How—after three degrees and two successful teaching positions—could I be unemployable? Neither the university nor the community college was hiring. After several weeks, Naomi suggested that I search for a job at a high school. I was sure that area high schools no longer offered art courses, much less ceramics courses, but I decided to look up the local school district job listings. . . and there it was. Posted that morning was a part-time ceramics teaching position at Gainesville High School. When I called the school, the nicest man answered the phone and told me they were interviewing that day, so I should come down to the high school immediately. I printed the application packet I’d used to apply for university positions, drove to the school, and walked into the principal’s office. He was surprised—it turned out that one of the janitors had answered the phone, and the school was not interviewing candidates that day. Nevertheless, the principal looked over my packet and invited the assistant principal of curriculum to sit in on an impromptu interview. They asked me what was the largest number of students I had ever had in a class and repeatedly asked if I was sure I was ready to teach high school students. I proudly reported that my most recent group had been twenty-eight in the advanced class at FGCU; they both laughed. I had no idea what I was getting into. My first year teaching at GHS was a part-time position (sixty-percent time) with full benefits. I taught three classes a day and had one planning period. The full-time teacher had retired a few years earlier, and by the time a few part-time people had rotated through the room, it had seen better days. Built in 1999 as an addition to a very old school building, the room had been designed by the last full-time teacher to accommodate Advanced Placement art portfolio students. Half the room was occupied by high-top drafting tables, the other half by low tables on casters. There were no potter’s wheels, no ware carts, and almost no clay. Taped to the kiln was a note from the previous teacher saying that the kiln wasn’t reaching temperature and she didn’t know why. Luckily, in my graduate program I had learned kiln maintenance and repair. There isn’t much I can’t fire or fix. Repairing the kiln was the easiest task in those first few weeks. Many days, I went home in tears after my last class. It was the most challenging work of my career, before or since. Teaching thirty first graders in an after-school clay club in Nebraska is nothing compared to teaching thirty-nine teenagers in a Florida high school day in and day out. After a few weeks and many meltdowns (both mine and theirs), we somehow got down to making with no budget and so little clay that by the second nine-week period I was almost completely out—and there were two more periods to go. Fortunately the University of Florida had tons (literally) of unclaimed student clay. I brought it into class and recycled it in five-gallon buckets. With this supply of clay, my assignments had fewer constraints. If it fit in the kiln, I could fire it. That first year, I had thirty-three ceramic students in Introduction to Ceramics and Ceramics 2 and almost forty students in Art 1, the introductory art course. Most students in Art 1 did not want to be there, and they let me know it every day. I was lucky to have support from the other art teacher, who was in her fourth year of teaching there and who, like me, had taught at the college level. She came down during her planning period to support me through my most challenging class, and gave me all her assignments for Art 1 so that we could pace our students together. She also helped me navigate the school system. I don’t know how I would have gotten through without her. The first year flew by. At the end I wasn’t sure I wanted to teach another year. The school wanted me back and to give me more classes. I am now in my fourth year at GHS. Our tiny program that had a questionable future now has more than 200 students enrolled and a waiting list. I teach all six periods a day with no planning period and have at least thirty students in every class. In the past three years, we have purchased pottery wheels, ware carts, and a new kiln and installed proper kiln ventilation. We are about to update the wiring in a former storage room to accommodate a new pug mill, which will help us recycle clay more efficiently. Some of my former students have entered college ceramics programs. Others are taking elective ceramics courses so that they can satisfy their passion for clay while working on degrees in other subjects. Most importantly, their experiences learning ceramics in high school have made them better creative thinkers and much better problem solvers. My class informs my students’ other classes in ways they might never know. And my class gives students in magnet programs that are highly challenging academically time to decompress. How I support my community of makers and district art teachers. 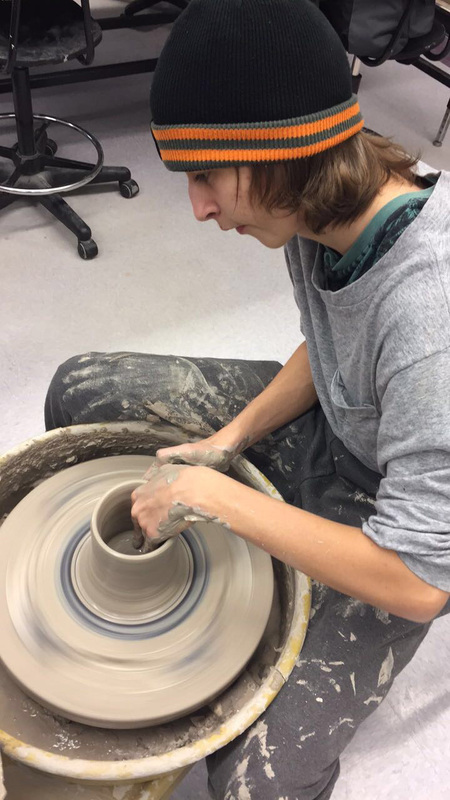 A few weeks into my first year of teaching high school, Diana Faris from AMACO contacted me about teaching ceramics education workshops for art educators in the area. She needed someone to host the event and twenty teachers to sign up. After discussing it with the district curriculum specialist and the GHS principal, I arranged for the school to be the host. The workshop was a success. The teachers who attended all seemed to love it, and got the chance to meet and discuss ceramics with other local art teachers. Many wanted to teach clay but didn’t have the necessary equipment or tools, some taught clay but had questions about processes or materials, and a few just needed help in firing their kiln. This first teacher workshop generated such interest that I have taught one every fall since, with AMACO as a sponsor. Every year at our back-to-school meeting, I take a poll of what my fellow art teachers across the district want to learn and then prepare a workshop to suit their needs. 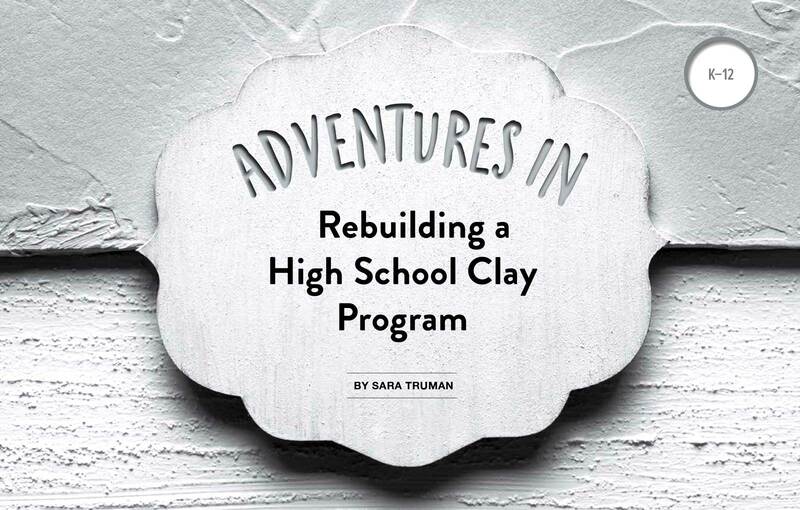 This year, I shared lesson plans that included how each of us can incorporate clay into the classroom. I prepared an informational packet for each attendee so they could refresh their memory when they use the lesson plans months later. I also address materials use and classroom studio safety, detailing proper methods for recycling clay and storing or disposing of hazardous materials. At the end of the year, programs that are unable to recycle clay transport it to my school, where we do it at the start of the following year. Working with our district facilities management department, we are working to ensure kilns in all classrooms are ventilated properly. My second year at GHS, I started teaching community classes in another potter’s studio. Many of my students were teachers that had taken the AMACO workshops. In 2016, when I had enough students, my wife and I opened our own studio. 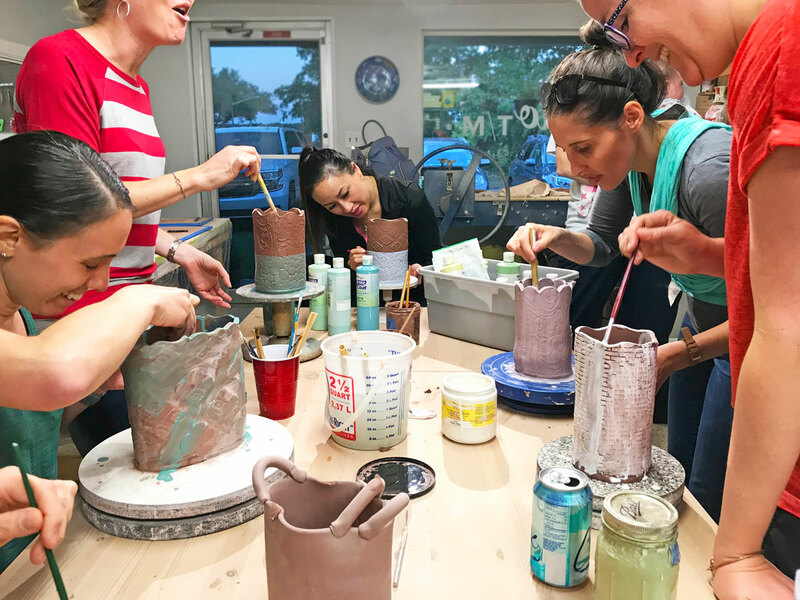 Studio T/M Pottery and Clay offers small community classes, girls’ nights, date nights, kids’ classes, workshops, and a one-year studio assistantship. I consistently have several district teachers in my classes. By developing their ceramics skills, they are able to increase the number of clay projects in their school programs and their teaching practices are improved. Two of my studio members now volunteer in district classrooms to assist art teachers during the year. Why I teach high school. When I was teaching at FGCU, I took some students to their first NCECA conference. That year Theaster Gates was the keynote speaker. Admittedly, I didn’t know he is a well-known social practice and installation artist before the lecture that night. I spent the rest of the week talking about his amazingly inspiring speech every chance I got. These conversations with my peers about diversity in ceramics were exciting, and I felt they were sincere in their desire to respond to his message in a meaningful way. When I got back to FGCU, I looked at the composition of my student body with new eyes, and I was struck by what I saw. Although there were several Latino students in my classes, most of my students were white. GHS is located in the middle of Gainesville, and because of the magnet programs and our county school choice program, the student body is diverse. But my first ceramics class was still mostly white. The previous teacher had set prerequisites for the Introduction to Ceramics classes that required students to complete Art 1 and 2 first. Students also had to have a recommendation from their Art 1 or 2 teacher to move to the next class. I am opposed to prerequisites for any introductory course, college or K-12; the point of an introductory course is that it is the first. At the end of the year, we removed prerequisites from the intro ceramics class. This decision changed everything. The second year, my classes doubled in size and started to reflect the diversity of our school and community. Friends of my students started wandering into the room to see what we were working on. My colleague and I revived the year-end student art show. We found display walls and pedestals stored in the back room; students painted them and patched the damaged spots. When the show was up, other teachers brought their classes to view what our students had accomplished. The year-end shows give my students a sense of pride in their work and get other kids interested in the art classes. It lets colleagues see what the students do in my room every day. There’s a potluck reception for the show, to which the students bring their families and a dish to share that reflects their culture. The potluck truly celebrates the students’ accomplishments. I see clay as a great equalizer for our students; it evens the playing field. It doesn’t matter if students had art classes before they got to my class because they are all learning together to use their hands to create. With their hands busy, they are less likely to be distracted and to distract each other. They can get up and move freely around the room, which is a welcome change from their lecture-based courses. What we need for the future. When I get frustrated or things feel impossible (and they still do sometimes), I recall Theaster Gates’s lecture and revisit his online TED talks. I am continually seeking answers to the question, how can we expand the field and make it more inclusive? I am doing what I can to build a more diverse clay community. In addition to updating equipment and safety, enrollment expansion, and student art shows, I’ve created an after-school Clay Club, established a visiting artists program, and partnered with university professors in offering scholarships. 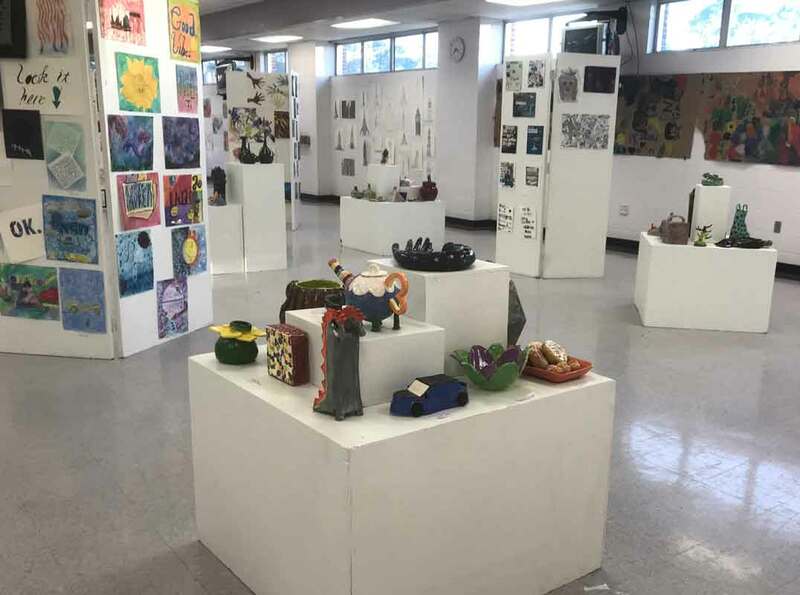 With college clay and art programs being cut across the nation because of low enrollment numbers and even lower funding, the clay community needs to re-evaluate its approach to recruiting students in both K-12 and higher education. Introducing students to clay in the K-12 system will lead to more demand for college clay programs. 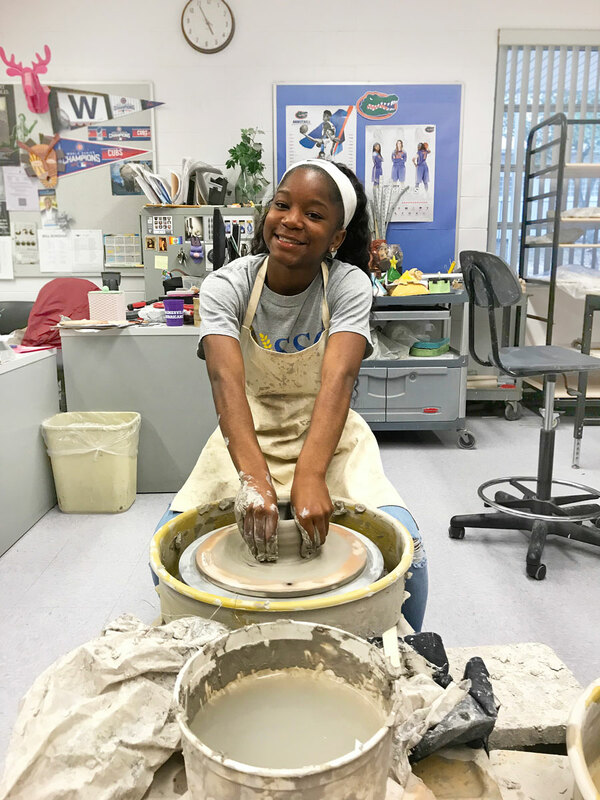 Fostering interest in clay in schools with a diverse range of students will result in more diverse collegiate clay programs (and colleges in general for that matter). Ultimately, what we teach from elementary school on will make the clay community representative of the multicultural world we live in. Sara Truman is a ceramic artist and educator living in Gainesville, FL. She teaches ceramics at Gainesville High School. 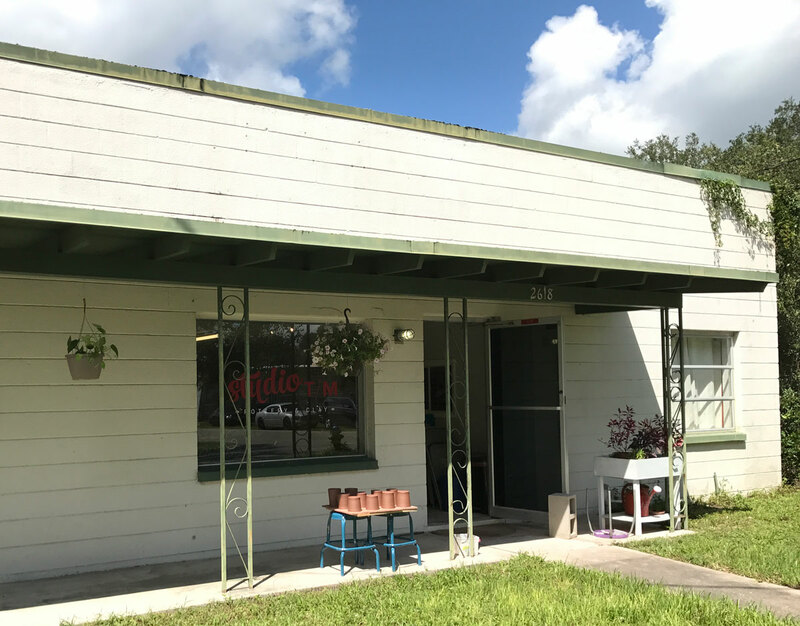 She is co-owner of Studio T/M Pottery & Clay, which serves as her studio space, in addition to offering community classes and a 1-year studio assistantship. Contact her at sbtruman@gmail.com, and follow her on social media @studiotmceramics.